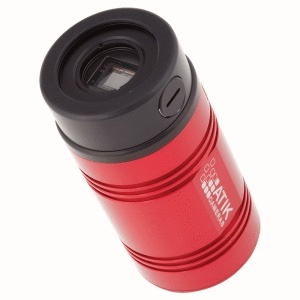 The Atik 414EX follows on the footsteps of the 314L+, one of the best cameras available for astrophotography. It features the brand new ICX825, the much awaited successor to the venerable ICX285. It also features the same EXview HAD CCD II that is used on the 428EX, 460EX and 490EX, which combined with the larger pixel size makes it sensitive beyond anything previously seen in this price range. But the 414EX is more than just sensitivity. It's cooler can easily achieve over 30ºC below ambient, and is regulated, so that your image calibration is consistent. And speaking of calibration, for most applications, the camera has such a low dark noise, that dark frames are an option rather than a requirement. Spend more time imaging is our motto! The Atik 414EX narrow footprint means that is can be used on Fastar/Hyperstar configurations, with zero obstruction even on the 6" version. Low weight also keeps the stress on the corrector plate to a bare minimum. The Atik 414EX is a truly impressive camera, which will bring you joy for many years.